As the owner of an animal, you do not have to go through an agony when your animal is lost or even worse, stolen. Collars are easy to remove and they sometimes even pose a danger to the more adventurous animals. There is only one way to take away your worries and increase the chances of your pet coming back to you, the rightful owner. Get your pet fitted with an EasyTrac ID microchip at your vet. Each microchip has its own unique identification number and can easily be inserted by your veterinarian under the skin of the animal. This number is registered with your name in a database. Almost every veterinarian, every asylum and every local authority (police) has a special reading device with which a microchip can be read. If your pet is found and brought to one of these places, they scan the animal for the presence of a microchip. The unique identification number in the microchip is looked up in the National database and linked to the animal found. You will be contacted and thus reunited with your lost pet. Our internet database is always accessible, 365 days a year and once registered, you can always change your data. It is, of course, of utmost importance that the database has correct data; so when moving to a new house or when there is a change of owner or death, you need to change the data of your registered animal promptly. 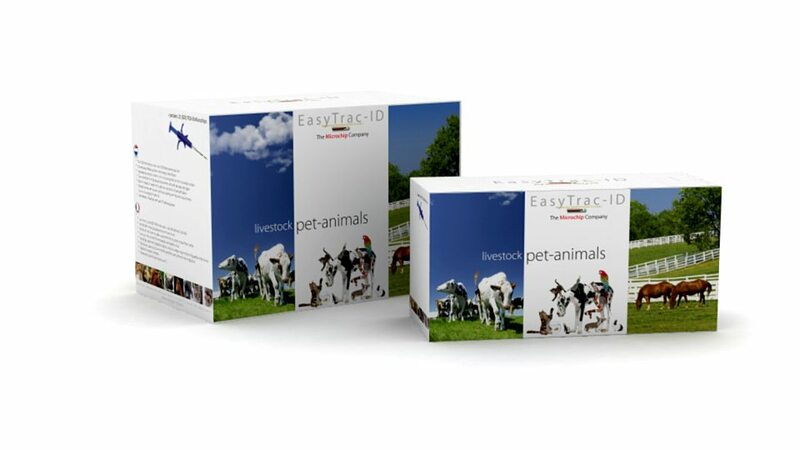 EasyTrac-ID microchips can be used on ALL animals of any age: not only dogs and cats, ferrets, horses but also mice, ostriches, elephants, exotics, reptiles, sheep and goats, turtles, deer, pigs, fish etc. How does electronic identification work? A microchip the size of a large rice grain is injected under the skin of a (domestic) animal. Then, a reader makes the chip number discoverable and you can register your data in a database. The ISO chip consists of 15 digits. This number combination is unique and therefore suitable for identifying something like an animal or a utensil. This chip is an ISO microchip of the type FDX-B and can also be used for horses, for example. The chip functions in accordance with ISO standard 11784 (code structure) and ISO standard 11785 (technical concept). The unique 15-digit code of this pet chip often starts with a code of the manufacturer of the microchip. This is indicated by the first 3 digits. For example, the code of Easy Trac-ID is 967 which is followed by the remaining 12 digits or the (ISO) country code. The total number of digits (15) cannot be changed. Therefore, there will be no confusion regarding the identity of the animal. The microchip is 2x12mm or 1.4x8.5mm for small pets. The microchip usually consists of a tube of (bio) glass. The bio glass microchip is provided with a Parylene coating that prevents rejection and promotes fusion of the microchip with the tissues. The microchip itself is not active. There is no battery in it and thus the lifespan is virtually unlimited. The reader is an electromagnetically controlled transmitting and receiving device. The reader emits an electromagnetic signal that activates the microchip and the identification code appears on the LCD screen of the reader via a radio signal. ‘ISO’ stands for International Standardisation Organisation. This committee establishes worldwide technical standards for all kinds of products. The idea of ISO is that every ISO (FDX-B type) microchip must be able to be read independent of the manufacturer brand of the chip by an ISO reader (independent of the brand or its manufacturer). The microchips used by veterinarians in Europe are all ISO chips. These can be read with an ISO reader. The EasyTrac-ID reader, however, also reads other identification chips. So, you can also use our reading equipment to read older non-ISO chips (FDX-A type). These are still being used in some countries (South America, Central America and the USA). Dogs, cats and horses; which animals can be fitted with a chip? In fact, all animal species can be identified by means of a chip.